Preparing for the holiday shopping season at Watters has been crazy this week. It’s the annual mad rush to harvest, ship, unload, and set up hundreds of various holiday plants, trees, and poinsettias. Fully packed trucks hurriedly deliver trees, poinsettias, Christmas cactuses, amaryllises, fresh wreaths, and garlands then run back to the farm and hurriedly reload for another trip. It’s a busy time, but exciting to feel the energy of the season charges each day! 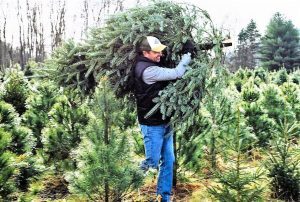 Next weekend is when most folks traditionally buy their Christmas trees, but before walking onto the lot they should know how to choose the freshest cut tree, what tree choices are available, and which trees will stay “fresh” through the New Year. Something to know before buying a Christmas tree: there are trees being sold that were cut months ago and were sprayed with artificial preservatives or soaked in lakes while waiting for their ship dates. Farms using these techniques harvest and ship for the national retail chains. If the tree looks like it has been cut weeks ago, it probably was. Stay away from trees displayed in the Arizona sun. Our sun is so intense, the air so dry, that just a few days of standing in our mountain air makes a difference between a tree that will make it safely to Christmas and one that is a tinder box waiting to spontaneously burst into flames. Green needles leaping off the branch as your hand glides across the branch is never good; stay away from these trees no matter how fresh they look. Fresh trees have green needles that will stay on the branches when touched. Not all trees are equal when it comes to freshness. At Watters we sell three different varieties of Christmas trees. In order of longest lasting freshness to the shortest -lived cut tree they are: Fraser fir, Nordmann fir, and Nobel fir. 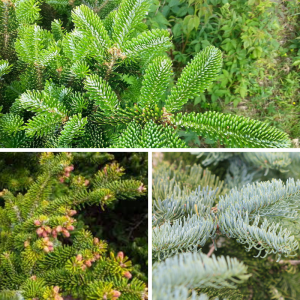 Of course, shape, size, color, and texture all go into choosing a Christmas tree, but if you don’t have a favorite tree already in mind, use this 3-tree freshness guide to make a decision. As all trees lose moisture they lose weight, so it stands to reason that the heaviest trees are the freshest trees. If deciding between two trees, choose the heavier one. A heavy tree is still full of water within its branches. A big trunk indicates a tree that lasts longer because it has a greater water-holding capacity. The trunk of any tree is much like a cluster of straws glued together. The capillaries store and move water up through the trunk. 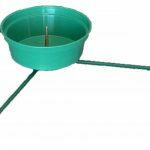 The larger the trunk, the more water-retaining straws there are, and the “fresher” your tree will be for the longest time. The wider the trunk, the better; just make sure it will fit into your Christmas tree stand! 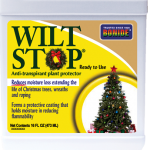 ‘Wilt Stop’ guarantees a Christmas tree will “last” through the New Year. This clear spray is used to coat the needles with a festive sheen; but, more importantly, it prevents the tree from perspiring. If the tree doesn’t lose moisture through its needles it will retain more water and stay “fresher” longer. ‘Wilt Stop’ is a must for trees in very dry homes and in rooms that are kept on the warmer side of their thermostats. ‘Wilt Stop’ is even more effective on fresh-cut wreaths, garlands, and swags. ‘Tree Preservative’ added to a stand’s water basin really works! It keeps a tree’s pores open and allows for more water uptake into the tree. Stay away from adding sugar or carbonated drinks; they simply clog the tree’s system and reduce water absorption. Trees can “drink” over a pint of water each day, so check the water level daily and supply lukewarm water as needed. All the more reason to use a tree stand that holds a gallon or more of water. I hope that you e-readers will hit ‘Share’ so your friends/followers can have all this information and become Christmas tree expert buyers, too! Until next week, I’ll see you amongst the Christmas trees here at Watters Garden Center. Ken can be found throughout the week at Watters Garden Center, 1815 W. Iron Springs Rd in Prescott, or contacted through his web site at WattersGardenCenter.com or FB.com/WattersGardenCenter .